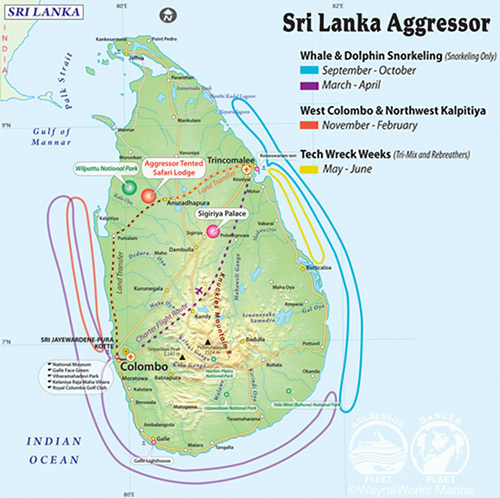 The Sri Lanka Aggressor is now under construction along with the Aggressor Tented Safari Lodge. We are now taking discounted booking for the Lodge and the live aboard charters. Expected launch of the ship is September 3, 2016. Are you ready for this exotic destination..? Tech & Rebreather Trips: The Tech Wreck itinerary departs from Trincomalee and explores world-class wrecks such as the HMS Hermes aircraft carrier, HMS Hollyhock and RFA Athelstane. With over 200 wrecks in Sri Lanka, 50 are identified as excellent or world class dives. Including the HMS Hermes the first ever British aircraft carrier built. The 600 meter wreck is residing at a depth of 54 meters along with 3 other support ships in 20 to 40 meter depths, The Sri Lanka Aggressor is fitted with 3 x 600 HP Compressors, Nitrox Compressor, Full Tri-Mix System and Rebreather System. Learn more about Technical Courses and Trimix Rebreather Fills. Land Trips: Sri Lanka offers world class wildlife parks full of large game animals; leopards, sloth bears, elephant, water buffalo, jackel, wild boar, deer, marsh and mugger crocodiles and 492 species of resident or migratory birds. Sri Lanka also has an amazing world heritage site dating back to the 3rd century BC and 5th century AD. The Aggressor Tented Safari Lodge is located near Wilpattu and Minneriya National Parks. Guests may stay for 3 nights before or after the Sri Lanka Aggressor and will experience big game viewing in both parks, seeing leopard, elephant, bear, buffalo, deer, crocodile, jackel and many other animals and birds in their natural jungle habitat. In addition as part of the package, will visit two world heritage sites, the 3rd Century BC ancient city in Anuradhapura and 5th Century AD Sigiriya Rock Palace. Here's a superb liveaboard and we are offering 30% discounts on a number of charters in 2016. Book between November 10 to December 20, 2015 with deposits paid before December 31, 2015 for this special opportunity. Here are the dates available, and most of these are 12 day trips. 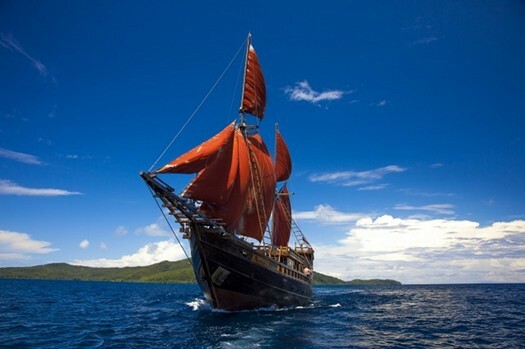 These charter dates are to Raja Ampat. If you have been considering a live aboard to RA, now is the time to book. Contact us for availability.